The ProFrom Performance 900i Treadmill and the ProFrom Performance 900 Treadmill are two different models with some similarities though. Therefore, for those hoping to acquire the ProForm Performance 900 Treadmill, the treadmill under review might just be an ideal choice. The ProFrom Performance 900i Treadmill has amazing features that help the user to achieve fitness goals real quick. It is designed to support 300 pounds/136 kg maximum user weight capacity with a wider and longer tread belt that allows the user to walk, jog and run without restrictions. The unit is unarguably a rugged treadmill that is yet sophisticated. It’s iFit ready which allows the user to run and explore amazing destinations all around the world. The Google Map automatically simulates the incline of the terrain. This allows the user to experience running or climbing the steep hills or a leisure walk on a beach. There are 30 built-in programs designed to surgically target achieving weight loss, good cardiovascular health, endurance improvement, overall physical fitness and more. The 2.75 CHP Mach Z commercial motor that is backed by a lifetime warranty provides a smooth and quiet operation that allows you to workout with comfort. The monitor provides a speed range of 0-12 mph and the digital quick incline system adjusts from 0-12%. Its space-saving design makes it not to be space invasive and could easily be folded when not in use and unfold when required for a workout. The 10 inches smart HD touch screen monitor displays every data as it is daylight. Click right here to have a peek at the discounted price of the ProFrom Performance 900i Treadmill on Amazon. The ProFrom Performance 900i Treadmill is ruggedly built to support a maximum user weight of 300 pounds/136 kg. It has a steel frame that is backed by a lifetime warranty. The running surface is equipped with the Proshox cushioning system that absorbs the shocks that are associated with running activity and reduces the stress that is often felt in the joints. It is a solid treadmill that also provides stability during an intense and vigorous workout. The rear and the front bases are well framed. It has an easy step-on design because the deck height from the ground is about 11 inches. The treadmill is a little bit large and therefore will require a sizable apartment for comfortable use. The dimensions are 73 inches long by 37 inches wide by 59.8 inches tall. In other words, the workout area required will be 6’1’’ long by 3’1’’ wide perimeter and a ceiling height of at least 7’’ height depending on the user’s height. That said, an additional extra clearance of 1-2 feet will be necessary at the rear and on each side of the treadmill for safe and convenient workout experience, especially if it is going to be used in a confined area. The treadmill is equipped with 1.9’’ track rollers. The tread belt is 20’’ wide by 55’’ long, space enough for walking, jogging and running exercises. 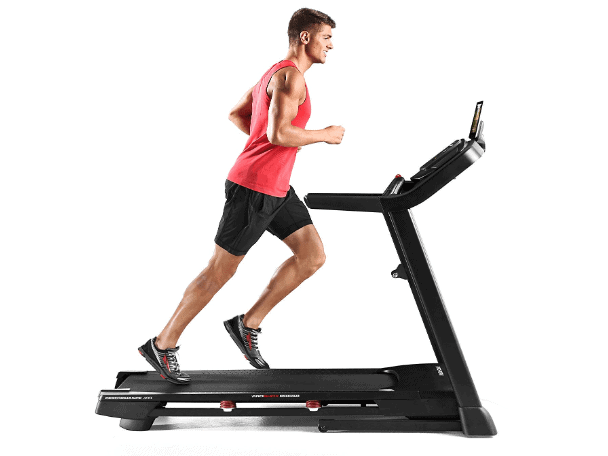 However, it may not be spacious enough for a taller individual to perform a serious running exercise as the 3G Cardio Elite Runner Treadmill does. Nevertheless, the ProFrom Performance 900i Treadmill is considered one of the best treadmills considering the price tag of the 3G Cardio Runner Treadmill. The large console features the 10’’ HD touch screen, quick speed buttons, quick incline buttons, iPod-compatible sound system/MP3, dual 2’’ speakers, cup holders, a tablet holder and more. The ProFrom Performance 900i Treadmill is equipped with a 2.75 CHP Mach Z commercial motor that is tasked with providing a quiet and smooth operation that supports walking, jogging and running exercises without getting overheated. This means no noise interference when watching a movie, a favorite TV show, or listening to music. The family and the neighbors won’t be bothered either by the workout activity. As aforementioned, the motor provides a speed range of 0-12 mph. The console is where most of the interesting sophistications reside on this treadmill. The console features a colorful 10’’ HD touch screen that displays all the workout data that include incline and speed positions. There are quick-speed and incline buttons that allow you to adjust the speed and incline in just one touch on the go. The EKG pulse sensors when gripped during a workout make it possible for your heart rate to be read and be displayed on the monitor so that you can maintain your target heart rate zone at all times. The console is also iFit coach ready. This means that you can access iFit account from the enabled equipment, computer, tablet or smartphone without module required. There are over 16,000 on-demand workouts offers, everything from high-intensity interval training to outstanding global experiences. The Google Map simulate different kinds of interesting workout terrain that ranges from providing experiences of hiking the snowcapped Swiss Alps to running on the sun-kissed beaches of Hawaii. There are also 30 preset workout programs that were designed by certified personal trainers. In other words, you can train to lose weight, perform interval-trainings, and everything between. 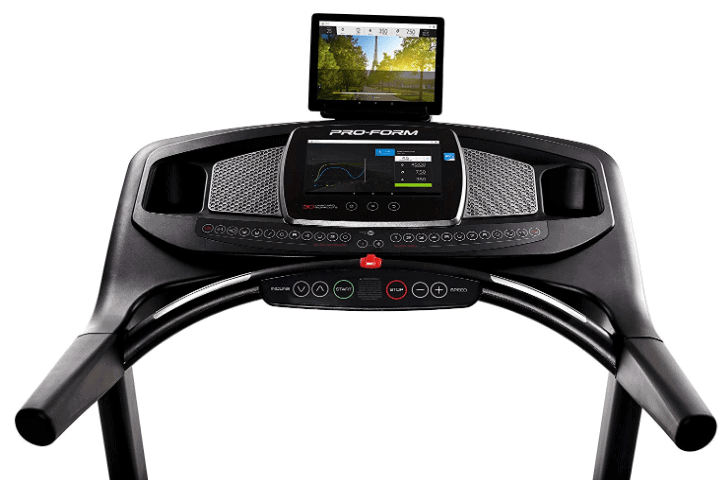 Training with the ProFrom Performance 900i Treadmill is like training with a virtual personal trainer in the comfort of your home. You can keep yourself entertained while working out by using the MP3/iPod compatible port and the dual 2’’ speakers to listen to some good music that suit your nerves. The ProFrom Performance 900i Treadmill has an automatic incline system that is controlled by buttons. Just as the speed, the incline system is an integral part of the 30 preset workout programs because when a built-in workout program is selected certain incline level and speed range are assigned automatically. The incline level can also be manually selected and there is 0-12% incline level. The storage of the ProFrom Performance 900i Treadmill is made easy because of its space-saving design and the integrated transports. The folding and unfolding mechanisms make it easy for the user to fold it up when it is time to put it away and unfold when it is time for a workout. It can be relocated through the transport wheels to the storage location. Basically, it takes less space when folded up hence doesn’t require a large storage area. It can be stored next to a wall. The treadmill is equipped with cup holders that double as items holders for keys, remote control, etc. The cup-holders allow you to keep water handy for maintaining hydration during a workout. There is also a tablet holder that is strategically positioned so that the display won’t be blocked when a device is placed on it. The tablet holder keeps your tablet at the right angle so that you can view and connect and share your workout progress with friends, watch a movie, and browse the web. These activities simply make you comfortable and motivate you to workout longer for greater results. The ProFrom Performance 900i Treadmill is shipped in a box that weighs 203 pounds/92 kg. The shipping cost of the product depends on where you are purchasing it. However, retailers such as Amazon provide free shipping and delivers within days of order. The assembly is pretty easy. Users have reportedly been able to assemble in less than an hour because the unit is delivered with the major components already preassembled. It comes with an instruction manual that walks you through the assembly process and the tools required for the job are also included in the package. Generally, treadmills don’t need any major or serious maintenance and the ProFrom Performance 900i Treadmill is no different. Of course, the tread belt will need periodic lubrication for smooth operation. The owner’s manual includes comprehensive detail of how to maintain the treadmill. The ProFrom Performance 900i Treadmill is a unit that users have excitedly recommended on Amazon. It is integrated with most important features imaginable that can help in achieving the physical fitness health any user has ever desired.